Performers include: Kevin McKidd, Ray Stevenson, Polly Walker, Kerry Condon, James Purefoy, Ian McNeice, Coral Amiga, Lindsay Duncan, Lidia Biondi, Tobias Menzies, Nicholas Woodeson, Indira Varma, David Bamber, Chiara Mastalli, Manfredi Aliquo, Suzanne Bertish, Max Pirkis, Lee Boardman, Esther Hall, Ciaran Hinds, Anna Fausta Primiano, Michael Nardone, Kenneth Cranham, Allen Leech, Guy Henry, Anna Francolini, Camilla Rutherford, Simon Woods, Zuleikha Robinson, Karl Johnson, Alex Wyndham, Paul Jesson, Daniel Cerqueira, Alessio Cuna, Lorcan Cranitch, Nigel Lindsay, Valery Usai, Massimiliano Ubaldi, Lyndsey Marshal, Haydn Gwynne, Dominic Atherton, Julianne Liberto, Rick Warden, Amy Marston, Sara Pasqualone, Simone De Marinis, Enzo Cilenti, Alan Williams, John Boswell, Kathryn Hunter, Alessio Di Cesare, Marco Pollak, Cosimo Fusco, David Quinzi, and Clive Riche. Half a century before the dawn of Christianity, Rome is the wealthiest and most powerful city in the world. 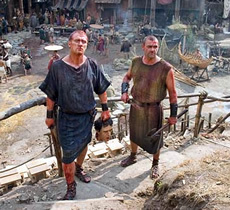 Taking place around the time of the violent transformation of the Roman Republic to the Roman Empire, this drama includes the rich and historically famous but primarily follows the lives and families of two ordinary Roman soldiers, Lucius Vorenus (Kevin McKidd) and Titus Pullo (Ray Stevenson). Other characters include Atia of the Julii (Polly Walker), Octavia of the Julii (Kerry Condon), Newsreader (Ian McNeice), Vorena the Elder (Coral Amiga), Servilia of the Junii (Lindsay Duncan), Merula (Lidia Biondi), Mark Antony (James Purefoy), and Marcus Junius Brutus (Tobias Menzies).